Q: What's the most tranquil, soul-replenishing place you've been to in China? I'd like to leave this country on a positive note and hopefully with a little more zen than when I first came. Living in a noisy, polluted city has had the complete opposite effect however but I don't think the damage is permanent. If I could only find a nice, quiet place to relax and retreat from urban life, I think I'll leave as a new person. I'm imagining some place with misty mountains and ancient temples, bamboo trees and winding streams...yeah, that's probably just an imaginary place or a set in a movie. But still, it's worth a try asking. I went to Wutaishan last year, it's about 4 hours drive south of Datong in Shanxi. It doesn't have the bamboo you're looking for but it is a UNESCO World heritage site and has more than 53 sacred temples. A very peaceful village surrounded by 5 flat mountain tops. We spent our nights there in a monastery and it was great! On the way there you can see the hanging monastery and the buddha carvings around Datong. 31'000ft above it, Boeing 777-300ER. Really? With Chinese on board? Difficult to fathom as either "tranquil" or "soul-replenshing". Kanas, Xinjiang. Just like Canada...beautiful scenery, mountains, lake and the river. I live 6 or 7 hours south of Kanas and have been talked out of visiting as none of the hotels there have hot water, showers or toilets (real). Still, might make the effort next year after winter's over. I live 6 or 7 hours south of Kanas and have been talked out of visiting as none of the hotels there have hot water, showers or toilets (real).Still, might make the effort next year after winter\'s over.Should. @royce: it is not usual Chinese hotels (in smaller cities) have hot water. Once, I booked room in hotel close to Jiamusi in Heilongjiang, because water heater in my apartment was broken. I just wanted hot shower in the hotel. Employee showed me (empty) kettles in my room. I was supposed to come in the morning to the reception, and fill my kettles with hot water for the day showers. Temperature outside was below -30*C.
Try Dunhuang. A couple of hours past Xian from Shanghai by plane. But it's worth it. The 1st thing that you notice when you get off the plane is that you can breath. After that you can go visit the Mongo caves. Yunnan and Guizhou may match the dreamlike place you're looking for. Grasslands of Inner Mongolia in summer or Taipei in winter. I live in a large house on 4 acres in the country, next to a lake at home. I like things like a river tour, but I really enjoy the chaos and circus that is China, if I'm watching it. Trying to drive or do banking etc makes me want to slit my throat. What China shows me is my life is too settled, guess the grass really is greener on the other side, but I also don't see legs like this at home. I'll vote for sitting around and watching legs all day. Inside a bottle of 12 year old Wild Turkey. My apartment, any time, day or night. Anywhere outside the main cities of Yunnan province. Almost everywhere in Yunnan is absolutely beautiful. 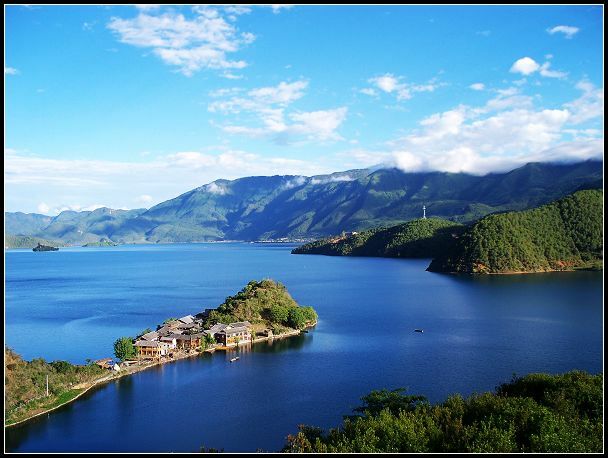 Get in a boat, and go relax in Lugu Lake. Lay down in the boat. Heal your heart and drown your woe. Rain may fall, and wind may blow, and many miles be still to go, but just lay under the boat and watch the clouds go passing by. I'm seconding Hulk's Yunnan suggestion. Lugu Lake is really lovely. Though I recommend going to the not touristy side of the lake (I'm sorry I've forgotten whether that is the east or west side). Another great Yunnan option is Nujiang and Dulongjiang (though you'd have to stick around in China until May to go to Dulongjiang: the pass is closed until then due to snow). Both are really beautiful, the people are interesting and with no stairs going up mountains it feels like more of an adventure. I used to go to Yangshuo to escape but i heard it is a tourist filled zoo now a days. Real shame. Yep, definitely Yunnan! After three years in Hebei and now in Yunnan, I now feel at peace. Every day is beautiful, you can see the sky and the stars. Air is fresher and cleaner, trees are greener, people are friendlier and if you head down to Xishuangbanna you will find awesome bamboo forests and wild elephants. Wonderful! The utterly gorgeous, exotically named 'Temple of Heavenly Paradise' in Guilin has got to be the ideal place to visit when you just want to unwind and let the best life has to offer pour over you, raise your spirits and leave your troubles behind. It's a little knocking shop in the city centre, just behind McDonald's. They also sell beer and have got a pool table. The answer must be the Potala Palace in Tibet. Really beautiful! The Potala Palace is huge and splendid. Last year, I traveled to Tibet and visited this dreamy palace. The colors of the wall are red and white. There are many steps and the road is zigzag. In this palace, there are many Tibetan antiques. Walking into this palace, you will have a better knowledge of Tibetan history. There are 1 user and 73 guests online.